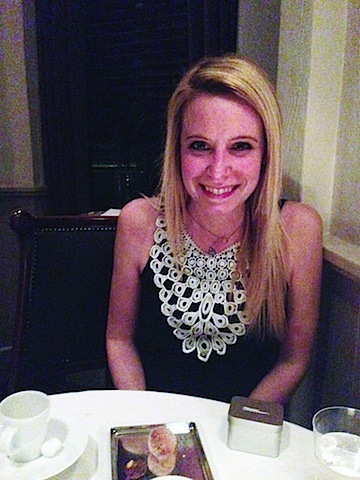 I had dinner at The French Laundry and survived to tell about it. Why wouldn’t I have survived? Because I pretty much almost died of happiness. How could I not?? If you’re food obsessed and you have a bucket list, there’s a fairly high chance Thomas Keller’s French Laundry is on it. It was certainly on mine (side note, my bucket list exists in my head and mostly consists of food-related items) and I still can’t even believe I had the chance to go. Let’s start with the reservation. 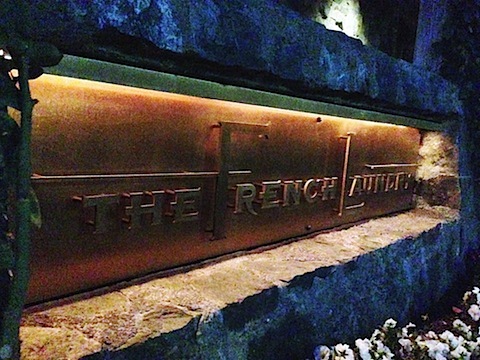 The French Laundry is known for being ridiculously difficult to get a reservation at. You have to call exactly two months in advance of when you want to go. At 1:00 p.m. EST on the dot. And keep calling until you get through (remember the busy signal? Yeah, that still exists). And if you don’t get through, too bad. You wait until tomorrow and try again. So, when Chris and I decided we wanted to plan a trip to Napa and Sonoma and definitely wanted to head to The French Laundry, we figured we’d just start calling and plan our trip around whenever we managed to get the reservation. Somehow, some way, we got through on our first day of calling. We were hanging out at my parents house and were kind of in shock since we expected it to take weeks (from hearing the stories of others), but just started planning our trip then and there. Wow. A little note on the dress code at The French Laundry since I’ve had a lot of people asking me… You should know that jackets are required for men (ties optional). I don’t think they have specific “rules” for women, but jeans, tennis shoes, shorts, and t-shirts are not permitted in the dining room. I would definitely recommend erring on the side of more formal/semiformal, like a dress and heels (or nicer shoes). But if you’re not a dress person, nice pants and a dressy top and heels should suffice. Definitely think “fancier” than typical California… But I have heard they’ll allow men to take their jackets off if the temperatures are too high! Oh, and I recommend you don’t wear anything too tight because you will be eating A LOT of food and want to be comfortable. Is there such thing as a “formal but roomy” dress code? Do that. Anyway, on to our experience! 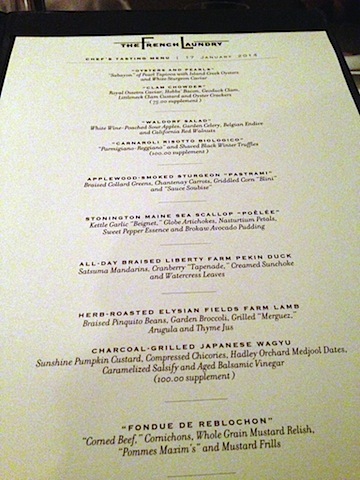 Our dinner at The French Laundry was on the tail end of our trip, at the end of a week filled with tons of food and wine (I still can’t get over how much I ate). It was a fabulous way to bring our trip out with a bang and I’m so, so happy I got to have the experience. Our photos aren’t the best since it was super dark in the downstairs dining area, but I figured I’d share anyway. I wasn’t even sure I’d take photos of the food until we sat down and Chris offered to do the snapping with his phone. He’s quicker and more discrete then I am. Pretty much everyone there was taking photos of their food, so it’s certainly not looked down upon, but we still wanted our concentration to be on the food and experience, rather than getting the perfect shot. Our waiter even offered to take a photo of us at our table. Yes, the menu is prix pice at $295.00/person (including service), but of course there are all kinds of add ons you can do, too (like the Japanese Wagyu for a $100 supplement!). We decided to have the sommelier pair our meal with wine and while it ended up being quite a bit of wine (maybe a little too much), it was worth it to know that we were drinking what was meant to be had with each course. prior to enjoying them, so I remembered that he got the idea for the cornets after a trip to Baskin-Robbins. I kind of love that. And these might have to be the first dish I attempt from the cookbook. 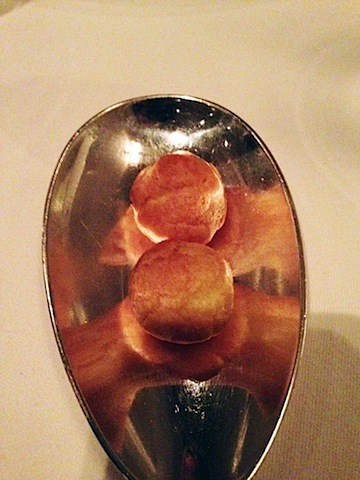 The gougéres were another little amuse bouche. I love gougéres, but these were about a billion times better than anything I ever even imagined a gougéres to be. You bite into them and get a burst of milton gruyere cheese. And heaven. And then the first course came… “Oysters and Pearls,” which is described as “Sabayon” of Pearl Tapioca with Island Creek Oysters and White Sturgeon Caviar. I am a big oyster fan (and especially loved that these were Island Creek! 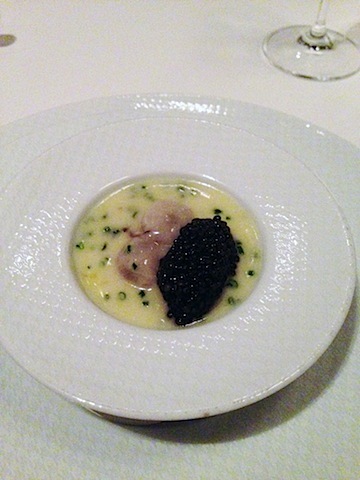 ), but this was like no oyster dish I’ve ever had (I think I could say that about every dish I had?). 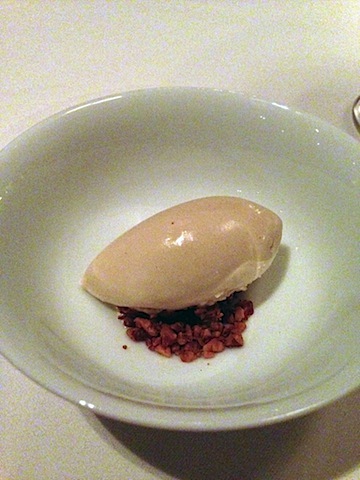 This dish was creamy and decadent and pretty much velvety, melt in you mouth. Can I have seconds, please? 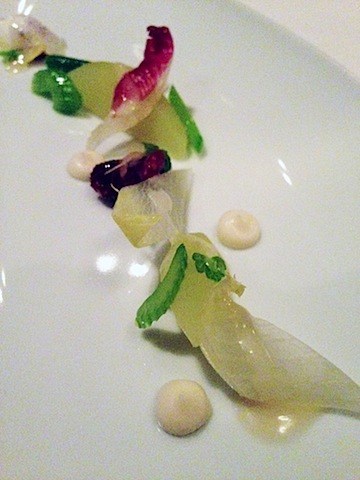 Course two was the “Waldorf Salad,” which included White Wine-Poached Sour Apples, Garden Celery, Belgian Endive, and California Red Walnuts. 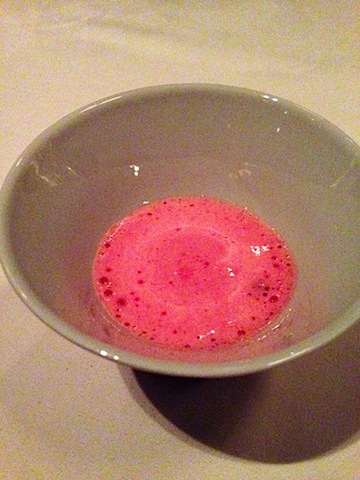 A totally approachable, simple dish that was the perfect refresher in the midst of the meal. I’d also like to keep a bowl of the white wine-poached sour apples in my fridge so I can snack on them all the time. Can you tell I’m happy? So, so happy! Time for the Applewood-Smoked Sturgeon “Pastrami” with Braised Collared Greens, Chantenay Carrots, Griddled Corn “Blini” and “Source Soubise.” Yes, there are a lot of quotes in that, but they’re worth it. A fish that has all the flavor of pastrami? It blew my mind. And that little griddled corn “blini”? I almost asked for 10 more. One of the things I LOVED about this meal is that it wasn’t totally overwhelming and I didn’t start getting stuffed to my gills after the third course. The bites really are small, but they’re powerful. I just couldn’t wait to see what was going to come out next. Moving on to the Stonington Maine Sea Scallop “Poêlée” with Kettle Garlic “Beignet,” Globe Artichoke, Nasturtium Petals, Sweet Pepper Essence and Brokaw Avocado Pudding. Avocado pudding? Yes. One scallop that makes you crave a million more? Please? I’m still not sure how they made that “beignet,” but I’d like to learn. ASAP. Guys, even the bread was way more delicious than your average bread. 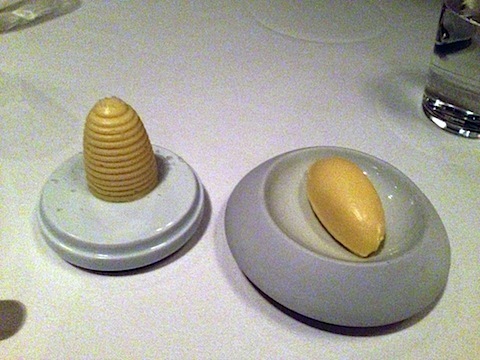 And the two types of butter, too. Yes, two types from two sources. The next course was All-Day Braised Liberty Farm Pekin Duck with Satsuma Mandarins, Cranberry “Tapenade,” Creamed Sunchoke and Watercress Leaves. This was the perfect wintery dish and definitely a little heavier than everything we had prior. But you know how I feel about cranberries and citrus. You could definitely tell this duck had been braising all day; so tender and awesome. Herb-Roasted Elysian Fields Farm Lamb with Braised Pinquito Beans, Garden Broccoli, Grilled “Merguez,” Arugula, and Thyme Jus. I know the photo isn’t the greatest, but can’t you tell just by looking at it how perfect this lamb is. Melt in your mouth. I wasn’t quite sure with “Merguez” was, but I knew I loved it. Turns out it’s a sausage. Not totally sure why the menu had it in quotes, but all I know is that I loved it. The last of the savory courses was one of the best. 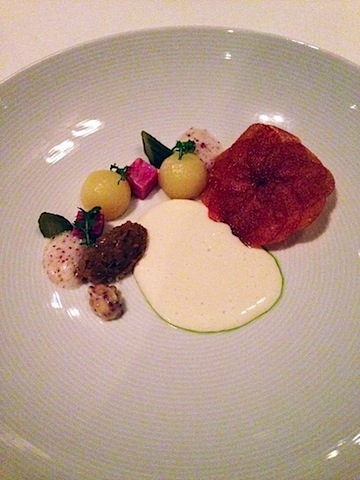 “Fondue De Reblonchon,” with “Corned Beef,” Cornichons, Whole Grain Mustard Relish, “Pommes Maxims” and Mustard Frills. I still don’t really understand how this worked or what the heck the quotes around “corned beef” meant, but I was in complete heaven and wanted this to last forever. Except that I was starting to get a little bit full. Just a little bit. But no rest for the weary because dessert was on the way… And there were a lot of them! Sadly the menu doesn’t detail them all (but yes, when you leave they give you a beautiful menu detailing most everything you enjoyed) and I basically have the worst memory in the world. 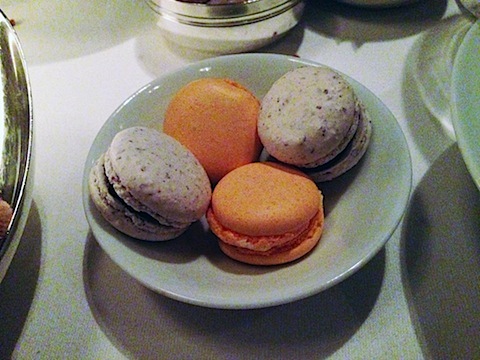 But I do know I swooned over Thomas Keller’s French macarons. They were perfect. 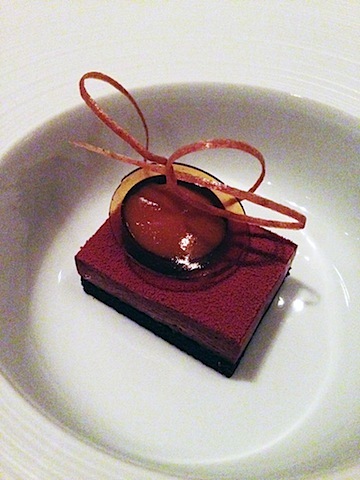 It didn’t take me long to gobble up this chocolate dessert. I’m most disappointed that I can’t remember precisely what this one was because it involved blood orange soda and had the most amazing consistency and was basically my dream come true. Next time (will there be a next time??) I’m definitely bringing a pen and paper, but to be honest, I was pretty much just sitting in my chair swooning and writing anything down or remembering for the long term was the last thing on my mind. I was just plain happy. But I do also wish I and a list of all the wines we tasted during the meal, too. I was told to ask specifically for the coffee and doughnuts, but I didn’t have to because they arrived at the table. And guess what? The “coffee” isn’t really coffee. 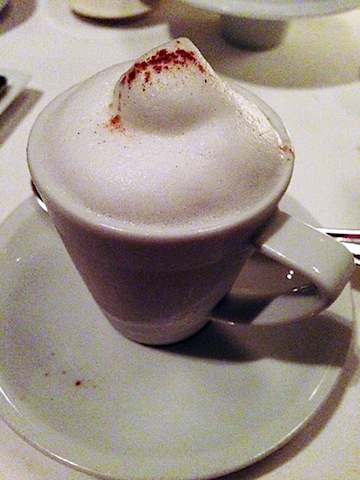 It’s actually a cappuccino semifreddo and when you dip your spoon into it, it will blow your mind. 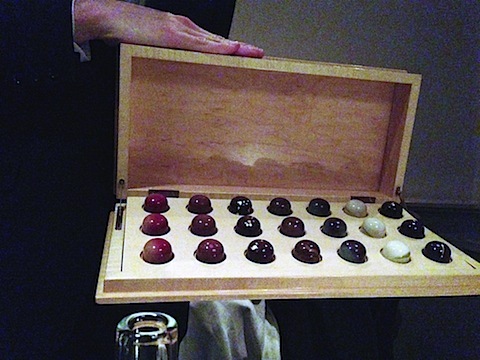 Oh, and we can’t forget the box of truffles we were presented with near the end of the meal. I chose salted caramel and Chris chose peanut butter and jelly. The night ended on a pretty fantastic note as well. The restaurant’s manager came over to us and asked if we’d like to see the kitchen. Um, YES. 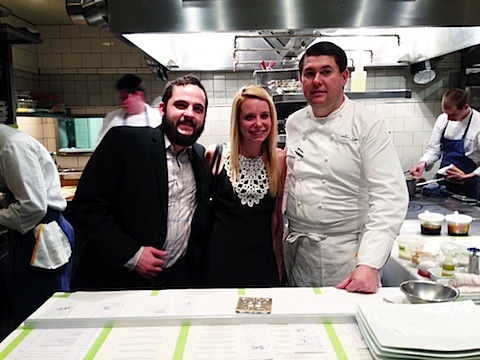 So, he took us back, introduced us to Chef David Breeden, and let us look around. What a stunning kitchen. To be honest, I was a little (OK a lot) overwhelmed and really didn’t take in the experience as much as I wish I had. My senses were on major overdrive and I basically just stood there and swooned. Chris and I with Chef David! 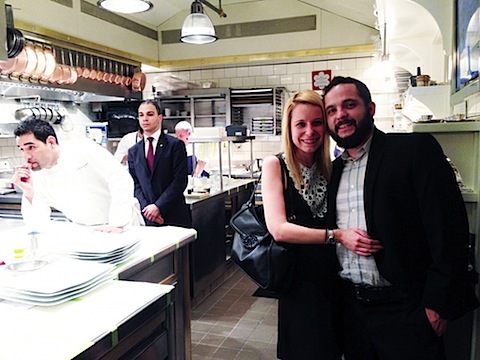 Couldn’t believe we were having our photo taken inside the French Laundry kitchen. So, yes, it was pretty much a perfect evening. Was it everything I expected and more? The food really absolutely was. It was creative without being ridiculous and decadent without being too much. I loved the service we received, though it wasn’t exactly what I expected. I thought it would be much stuffier and a little bit more flawless. But I didn’t have a problem with this at all as it was still great service and it was nice to feel relaxed and able to enjoy the experience. It was comfortable and classy. Would I go back? Well, obviously this was not a cheap meal. At all. But it was an experience. And one that I feel so grateful to have had. Also one that I definitely wouldn’t do every day or even every year. There are so many fabulous restaurants I want to visit, and a ton of them are in the Napa/Sonoma area. 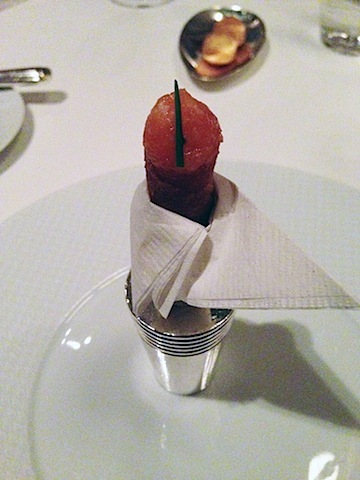 But I certainly wouldn’t say no if I had another chance to come back to the French Laundry in the future. Especially since the menu is always changing. And now I can die happy. And tell my future kids, who probably won’t care at all. But still, this is a memory that Chris and I will share forever. I’m planning to blog about the rest of our Napa/Sonoma trip, too (believe it or not, we ate more meals than just this one! ), probably in one big roundup post in the next week or so. Do you have any restaurants are on your bucket list? 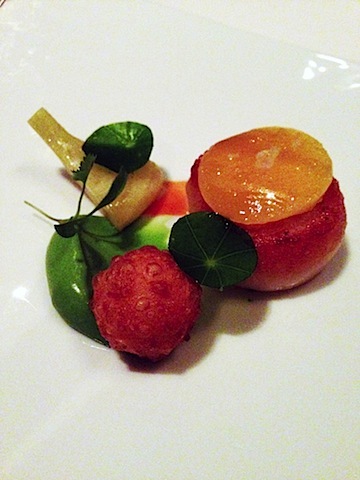 25 Responses to "Dinner at The French Laundry in Yountville, California"
So jealous. 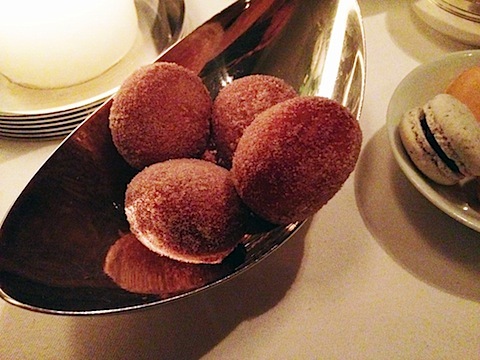 I once had the dessert tasting menu at Per Se (Keller’s NY resto) and had the famed coffee and doughnuts. Perfection! The French Laundry is definitely on my bucket list. I loved reading your review and seeing all your pictures. The duck alone seems like reason enough to go there… and of course those gorgeous breads. I might have to hire you to call for me when I’m ready to go – can’t believe you got through on the first day! I’ve heard it’s impossible too. 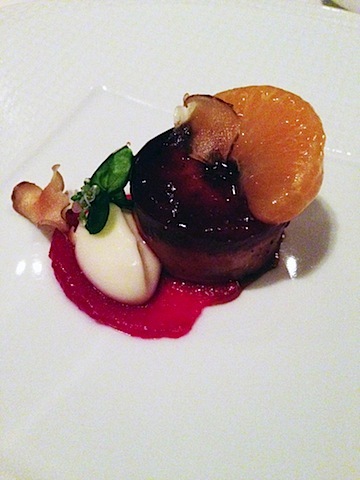 Oh I’ve heard so much about The French Laundry and I just wish I get to experience dining there! Soooo jealous. It’s on my list and especially a kitchen visit!!! Full disclaimer: I weighed about 40 pounds less prior to walking through those doors. So that explains the chubby look I have going on. End of disclaimer. Seriously though, this was unbelievable. So much good food and the wines they brought to match were spectacular. This is definitely on my bucket list! When I went out to Napa I got wait-listed for one evening. By the time we found out we were off the wait-list it was too late (no appropriate clothing and we spent too much $ on wine!). I would definitely recommend using the wait list though – I know a couple of groups that got in that way! Wow, what an epic meal! 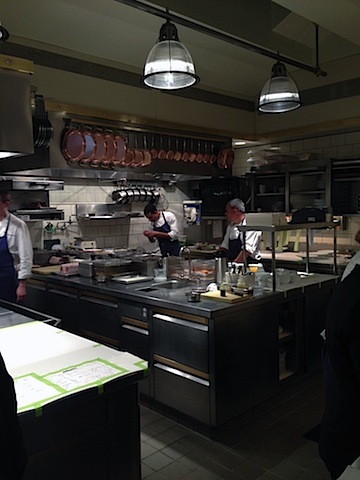 And SO amazing that you got to see the kitchen. I have a ton of restaurants on my “must-try list” – I definitely need to start visiting some of them soon! All I can say is wow! You are a lucky girl. Definitely is a bucket list meal. And by the way, I love the dress you wore on such a special evening. how amazing! stupid question, is it right in Sonoma? I thought it was further, maybe I’m wrong? Steve and I are thinking of honeymooning in Sonoma….and a dinner here would be the best thing! 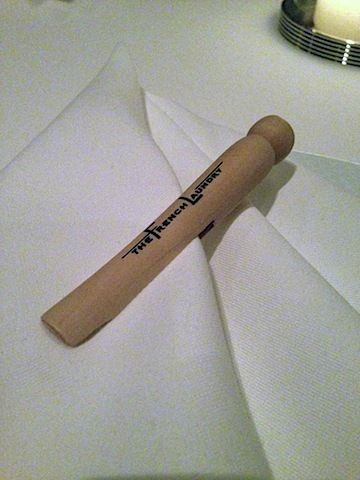 @Lexi- The French Laundry is actually in Yountville, which is in Napa. But they’re all so close. We must have driven back and forth from Napa to Sonoma 10 times in the week we were there. There’s so much to do in between! So jealous! Thrilled for you, but so jealous! Dining, not simply eating, but dining is such a multi-sensory experience. What a treat. In your opinion, does French Laundry have an east coast equivalent (not associated with FL, but an east-coast restaurant doing similar work in gastronomy)? @Kelly- Yes, I feel so fortunate to have been able to have this experience! 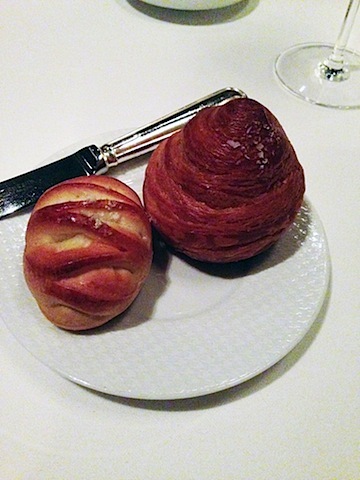 Hmmm, I’ve definitely never had a meal quite like this one, but know there are places in New York City that could be comparable, including perhaps Thomas Keller’s Per se (though FL has a bit more acclaim). 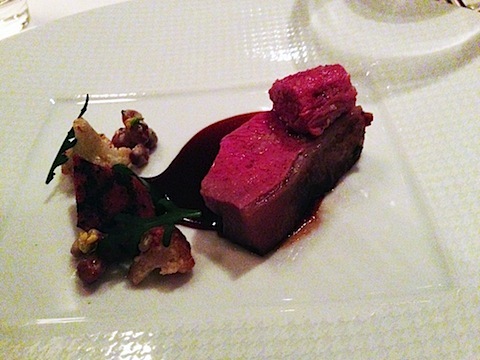 Next on my bucket list is NYC’s Daniel and Le Bernardin, which I think may come close. Sadly, there is nothing close in Boston…. 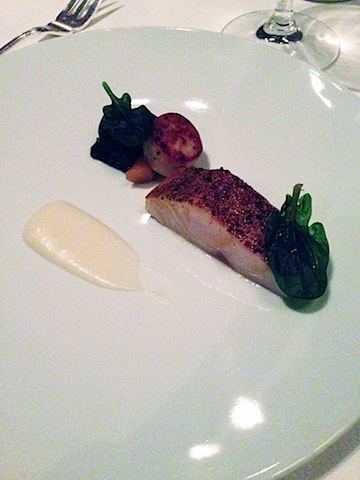 Though I haven’t yet been to Barbara Lynch’s Menton, but I would guess that’s the closest! Annnnd now I need this meal at 8:00 in the morning! OH my gosh, I am so jealous! When we were in Napa we wanted to do this…next time! so cool, so pretty, so interesting and so much fun! No way! What a feast! I absolutely need this on my bucket list. Every single thing you ate looks completely amazing! I’m so jealous! Chicago has the best restaurants in the country. Next Restaurant is on my bucket list. Next completely changes its style every few months, focusing on a different time period and part of the world for each “season” of its menu; the first period was Paris: 1906. So glad you shared this! I’ve always wanted to go to The French Laundry and now I want to even more. Glad you enjoyed the experience and didn’t just focus on taking pics. I know what you mean about feeling like you can’t remember it though. Our minds are weird like that! I’m so jealous, but so happy for you that you got to go! It sounds incredible! We stayed in Sonoma a couple of years ago and I regretted not trying for a reservation. Next time 🙂 Thanks for sharing! I have been so excited to read about your dinner there… wow! 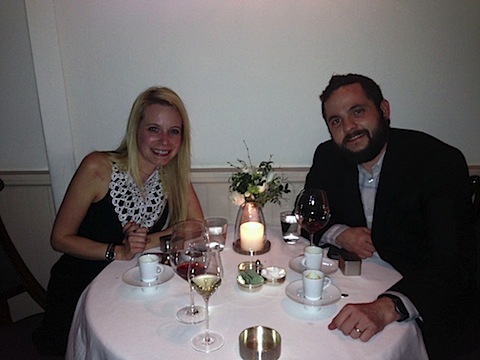 We have been to Napa a few times but never to French Laundry. I just send the post to my husband so maybe I can convince him to change that … ha! Your article is so endearing and generous. You totally deserved that meal and although I would love to go there myself, I hope you’ll get another chance to experience this special table which has inspired you so much. Thank you for sharing.